Specialty Cocktails with a Prohibition theme mixed by the Phoenix’s Cocktail King David Newman. 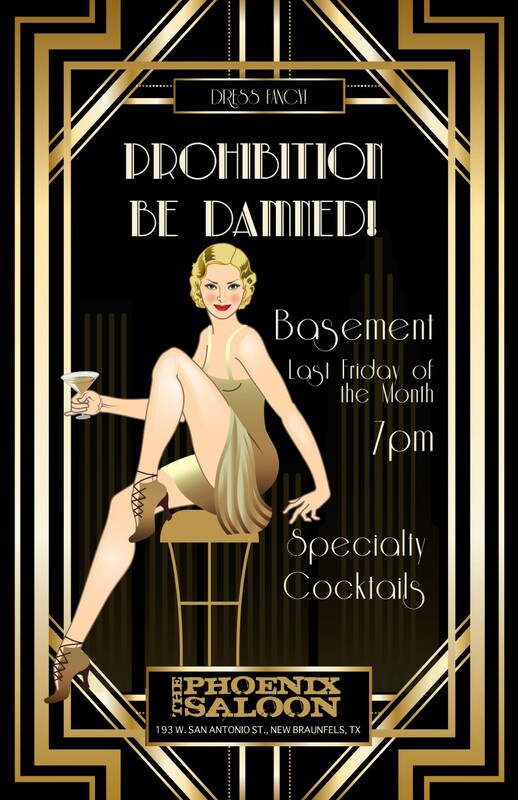 We open up the basement bar for this once a month (every last Friday). The Phoenix basement served as some kind of illicit brewery or distillery back during Prohibition. You are encouraged to act nice and dress fancy, take a walk downstairs, slip back into history, leave your troubles behind and enjoy a delightfully spiffing cocktail or two in this lost subterranean world hid beneath New Braunfels. Prohibition closed the original Phoenix Saloon down 100 years ago this year. We say… PROHIBITION BE DAMNED!